John P. Petrakis wrote: My 1997 purchased Aerotech Astrobee D has had it's LAST components glued on. It's painted and ready for decal application. I'll hopefully give it a dullcote once-over later in the week when warmer. I'm hoping to have it debut in two week in Berwick. Here it is... "all done"... Well I may reneg doin the dullcote layer. I kind of like the way it looks as-is... Even though it would hide the decals a bit better. Last Edit: 5 months 2 weeks ago by John P. Petrakis. That is one fine looking rocket. I'm looking forward to seeing it in person and seeing it fly. 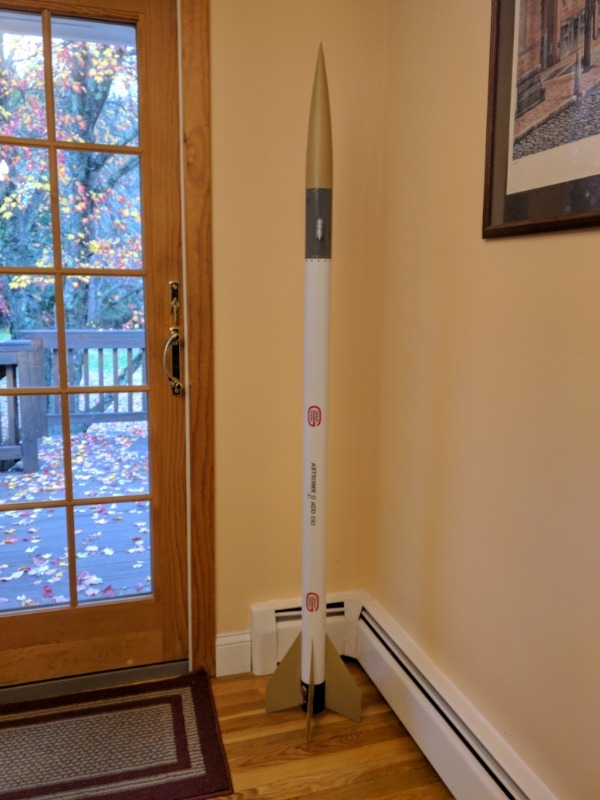 During the bye week I spent time repairing a rocket, setting up a 29 to 24 mm adapter and engine retention for another rocket and getting my Torrent ready to launch. I ordered an Astron Sprint XL for my friend Sal who is almost done with his Hornet. Today I ordered a few black powder motors and a Red Nova kit for myself. Well the windy forecast for next Saturday isn't looking too good at the moment. Of course 5 days out, you just never know for sure. I guess at this point considering Kenn's announcement regarding the Acton field for next year (specifically July 20) perhaps that Centuri Saturn V that's been sitting "mostly" built since the 1970's should be my next project for the upcoming weekend! You Centuri Saturn V must be a collectors item. What does it use for an engine? Well it would be if I hadn't started building it all those years ago... I had left it at the "time to paint it" stage around 1977 when I went to college. It has just the three engine cluster (friction fit!!!!). I built a 24mm motor mount to glue into place... I figure composite E's will do the trick as well as using an E12-4 for it. I may have mentioned at one time that I am a streak builder when it comes to building and repairing rockets. Some nights I don't even feel like picking up a bottle of glue where as last night I got in the groove. Being a rocket fixer is a major part of a rocketeer's job. I spent three hours leisurely repairing three rockets, two of which are ten years old or more. I looked into my flight log to see who needed fixing and got to it. First up was to repair a shroud line on an Estes Patriot. I sure could have used a large sewing needle for this. Second was a third and final coat of paint on the upper BT60 of a scratch build. The NC also needed a bit of repair so I used some CA and Fix-It Epoxy from Apogee. The Flis Kit Triskellion's eye bolt needed to be epoxied to the NC. I used some BSI 30 minute that I purchased from Animal Works earlier in the season. The bottom part of one of those end fins with the toothpicks was broken off. With some fiddling around I was able to cut off a small piece of balsa and CA it on. Some may say, "Frank, get a life." To that I say, I have a life and a hobby called rocketry.